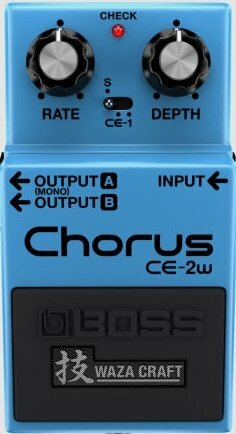 Soon after the iconic BOSS compact pedal line was launched in 1977, guitarists started requesting the CE-1 chorus sound in this smaller, battery-powered format. In 1979, these demands were answered with the CE-2 Chorus. Specially designed for guitarists, the CE-2 offered a milder modulation compared to the CE-1, always keeping the guitar sound sharp and well defined. This refined chorus tone was an instant success, becoming the go-to sound for hit guitar tracks throughout the 1980s and beyond. In addition to authentically producing the CE-2’s original mono-only sound, the CE-2W makes the classic pedal’s soft modulated tone available in stereo for the first time ever.